Ever wished you could put all Peter Jackson’s Tolkien-inspired films into one package? The new 30-disc collection from Warner Bros. does just that. Now shipping or available to pre-order from several retailers, the $500 Middle-Earth Limited Collector’s Edition includes all three extended films from both The Lord of the Rings and The Hobbit trilogies, and much more. Along with all the bonus content previously included in the theatrical and extended editions of each trilogy, the Limited Collector’s Edition includes an exclusive 100-page sketch-style book with replica of “The Red Book of Westmarch,” and, original reproductions of watercolor paintings by conceptual artists Alan Lee and John Howe. What’s more, all the discs can be stored in a one-of-a-kind Hobbit-style wood shelf (made of solid wood) that Peter Jackson himself approved for this special collector’s edition. At the same time, Warner Bros. has released The Middle-Earth Theatrical Collection ($44.99) with all six films on six Blu-ray Discs along with Digital HD copies. 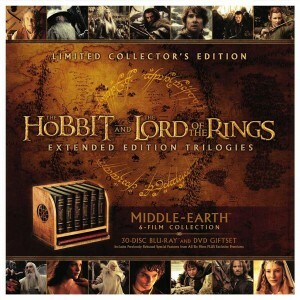 But if bonus content and extended editions are what you seek, the 30-disc edition is simply loaded with extra material. Here’s a breakdown of all the content. For the first time ever, Academy Award-winning director Peter Jackson’s epic adventure is available in one spectacular limited collector’s edition box set.